Detroit’s abandoned buildings and blighted neighborhoods have captured the attention of news media, artists, photographers, videographers and curious tourists for decades. National and international news outlets have brandished the negative images in headlines and photo galleries, often noting that the Motor City once was the nation’s “crown jewel” as the world’s automotive capital. Despite the doom and gloom portrayals, Detroit is emerging as a model for adaptive reuse of vacant industrial and commercial property. Its downtown and Midtown areas are in the midst of frenetic construction activities, as vacant buildings are converted into a variety of uses ranging from residential apartments and condominiums to offices, retail shops, art galleries and restaurants. 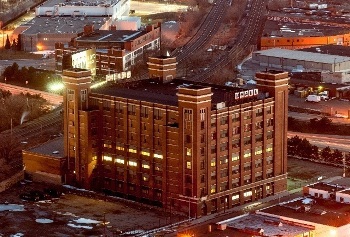 In the city’s New Center district, researchers from Wayne State’s Department of Urban Studies and Planning are studying the impact of sustainability initiatives emerging from U-Haul International’s adaptive reuse of the former Nabisco factory, located at 899 W. Baltimore St. In 2012, U-Haul International purchased a vacant, 283,000-square-foot, seven-story building with designs on adapting the historic structure into a mixed-use facility. By late 2015, the company had built out the first four floors, which included the first-floor office and showroom and three floors of storage units. The remaining floors and basement area are vacant and awaiting future plans. Over the next 18 months, Professor Robin Boyle and Associate Professor Rayman Mohamed will continue to lead researchers on the U-Haul-commissioned study, focusing, in part, on how the facility has contributed in various measures to the ‘turnaround’ climate currently underway in the New Center area. The study will also examine how, with modest investment, U-Haul might advance improvements along Midtown’s West Baltimore area. The study required a major time commitment and physical involvement. Interviews have been conducted with U-Haul staff, adjacent and neighboring businesses, and local development agencies. Researchers also have initiated field surveys and reviewed newspapers and business journals for content analysis. Looking ahead to the study findings, both Boyle and Mohamed agree that it’s premature to offer any results or predictions at this early stage. But they point out that the U-Haul reuse project offers several potential “positives” that contribute to sustainability in Midtown: Reducing blight in distressed neighborhoods, avoiding the environmental costs of demolition, preserving historic architecture, promoting economic development and providing jobs.